Case Diciotti : Salvini really risks 15 years of imprisonment? The Minister of the Interior explains that his sentence was taken for "stopping the landing of 177 illegal immigrants". On Sunday at Sant'Egidio alla Vibrata (Te), in Abruzzo, for the upcoming regional elections, Salvini declared: "Risk up to 15 years in prison because I blocked the landing of 177 illegal immigrants". 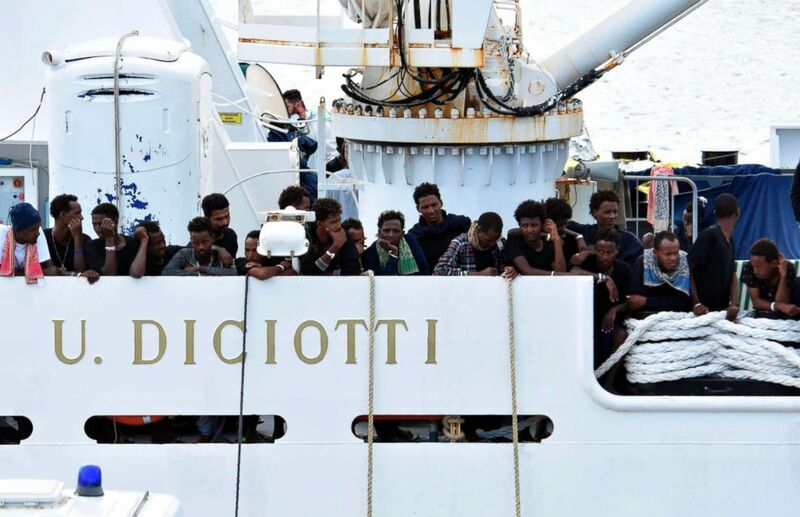 The Minister of the Interior refers to the case of the "Eighteen" ship and its judicial aftermath, which has returned in the last days because the Court of Ministers of Catania has asked the Senate for authorization to proceed against Matteo Salvini. Salvini's statement is imprecise for at least two reasons. On the night between 14 and 15 August 2018 the Italian Coast Guard 'Diciotti' rescued 190 migrants in the Maltese area of ​​the Sar (Search and Rescue). For five days the ship remained off the coast of Lampedusa, while Salvini argued with Malta and other European countries about the distribution of the survivors and threatened a rejection to Libya (which, as we had then written, had strong doubts about illegality). Only 13 migrants in serious health were disembarked as a matter of urgency, leaving 177 people on board. The number that Salvini has quoted in his statement. Migrants aboard the Italian Coast Guard ship Diciotti gather on the deck as they await decisions in the port of Catania, Italy, Aug. 24 2018. On 20 August the Minister of Transport Toninelli indicated which port of Catania, but Salvini denied the authorization to land, always in the context of the controversy with other European countries to take charge of the reception of rescued migrants. The ship was then anchored in the port with its human cargo on board. On August 22, 29 unaccompanied minors disembarked. The others were disembarked on the night between 25 and 26 August. This story led the Interior Minister to be investigated by the Prosecutor of Agrigento for kidnapping, illegal arrest and abuse of office. The investigation was then divided into two parts: that relating to the events that took place off Lampedusa was entrusted to the Palermo Public Prosecutor's Office; that relating to the events occurred in the port of Catania was instead entrusted to the Catania public prosecutor. The section of Palermo ended with the request for joint filing of the Public Prosecutor's Office and of the Court of Ministers, the special section within the court which is in charge of deciding whether or not to continue a process involving a minister of the Republic. a process involving a minister of the Republic. The catanese section instead saw, after the request for filing the prosecutor's office, the request to proceed with the investigations by the Court of Ministers. The accusation, as reported by Salvini himself on Facebook, would be "aggravated seizure of people and minors". A punished offense (Article 605 of the Criminal Code), in the maximum, with 15 years of imprisonment, as the two aggravating circumstances of the minority of the kidnapped and the position of public official covered by Salvini would compete. The question is then passed to the Senate, where it now expects to know whether the House - in which the attitude that will decide to hold the M5s will be decisive - will grant or not the authorization to proceed. The M5s will be Given the outlines of the matter, both factual and judicial, what is wrong with Salvini's declaration? First: there were 177 "illegal immigrants". The term, despite the positions taken by Salvini himself in the past, has no legal basis and should be avoided in journalistic and institutional communication. If even with this word they wanted to indicate irregular migrants, indiscriminately applying it to those who were on board the "Eighteen" at the end of August is a mistake. In fact, of the 177 passengers, as written by the National Guarantor of the rights of persons detained or deprived of personal liberty in a letter addressed to the Viminale, the majority were Eritreans. These are among the very few migrants to have a percentage of acceptance of their asylum applications of more than 75%. So it is very probable that among the 177 migrants present on board the "Diciotti" when it was anchored in the port of Catania there were many who were "real refugees", to use the vocabulary used several times by Salvini, ie entitled to the international protection. Second: the kidnapping in person is not blocking a landing. Even on the motivations of his investigation Salvini is, at least, very hasty. As the magazine of jurisprudence Law Penale Contemporaneo explains very well, which contains the contents of the request for authorization from the Court of Ministers of Catania, the judges ask to proceed against Salvini not because it has blocked a landing, but for the details, legally complex, of the affair . The point, simplifying, is that if until August 19 the choice of Salvini to prevent the landing was legitimate, from that day onwards it has not been more. The indication of Toninelli to the Coast Guard of the port of Catania as a landing place, has made Italy, officially and juridically, the "responsible State" of the management of migrants on board the "Eighteen", according to the norms of international law. The kidnapping of a person therefore depends on having deprived the personal freedom of the individuals of which Italy was responsible, without there being a justified reason. For them the Italian authorities had obligations enshrined in the Constitution and laws, in particular that of not violating their fundamental rights. Among these there is also that of personal freedom, unless there are demonstrable needs (for example, a danger to the security of the state). The Minister of the Interior instead - at least according to the accusation - would have prevented the landing not for reasons of security, thus compressing the fundamental liberties of migrants for a legitimate reason, but for political reasons. He wanted to put pressure on other European states to take charge of migrants. However, this is not a reason allowed by law to deprive individuals of their personal freedom. So Salvini does not risk a conviction for stopping a landing point and that's it, but for doing it in a way, and in a situation, in which his conduct was found to be illegitimate. Salvini, who complains about the risk of being sentenced to 15 years for having blocked the landing of 177 "illegal immigrants", an incorrect statement for at least two reasons. First, it was not 177 illegal immigrants: many of them were people who probably had the right to asylum, if we look at the precedents of their nationality (mainly Eritrea). Secondly, and more important: it is not a day that has blocked the landing for which Salvini risks the process. The reason is that that conduct was implemented illegitimately. Holding 177 people on board who had legal responsibility, some of whom are probably entitled to international protection, with the main reason - according to the prosecution - to use them as "leverage" against other European States to take charge of the their reception, and not for reasons connected with the security of the state or for other legitimate reasons, could according to the judges constitute the crime of aggravated kidnapping.